iWood Planed all Round Douglas Fir is ideal for heavy construction, piling, house building, roof trusses, interior and exterior joinery, due to it's durability. At iWood Timber Merchants we have built our reputation on supplying the highest quality timber, ensuring you have the highest percentage of usable Douglas Fir planed timber as possible from your order. 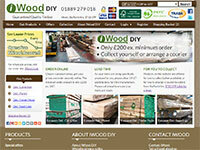 iWood is fast becoming the UK’s premier online timber merchants. Our website is designed to give you prices faster than anyone else at prices you’ll love. Plus, you’ll instantly receive even better timber prices by signing up for one of our easy free website accounts.